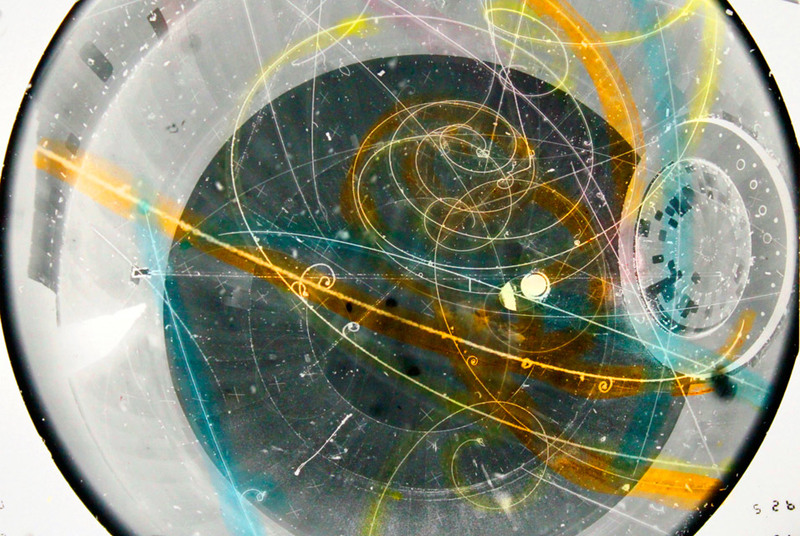 Jennifer West, Still from I ♥ Neutrinos: You Can't See Them but They are Everywhere (70mm Film Frames of Neutrino Movements - shot in 15 ft Bubble Chamber at Fermilab, Experiment 564 near Chicago - dunked in liquid nitrogen, neutrino movements events with invisible ink and decoder markers and highlighters, inked up by Monica Kogler and Jwest, filmstrip from Janet Conrad, MIT Professor of Physics), 2011, 37 seconds, Roll of Specialized Film For Scientific Use of about 1,000 Images transferred to hi definition video. CAMBRIDGE, MA.- The MIT List Visual Arts Center recently hosted a residency project with Los Angeles-based filmmaker/artist Jennifer West. Wests work consists of using a unique filmmaking process of subjecting diverse film stocks to numerous organic and mechanical processes (e.g. celluloid in various substances such as lithium, perfume, or mint; or physically manipulating film material in order to create vivdly abstract cameraless images. Her work at MIT included creating a portrait of a lab, using the chemicals, materials and equipment provided by collaborators. During two visits to MIT, West met with a wide range of researchers and faculty including: Stephen G. Steadman, Associate Director, MIT Laboratory for Nuclear Science; Professor Janet Conrad, MIT Department of Physics; Scott Speakman, Center for Materials Science and Engineering, X-Ray Shared Experimental Facillity; Michael Rubner, The Center for Materials Science and Engineering Leslie Kolodziejski, Integrated Photonic Devices and Materials Group,Department of Electrical Engineering and Computer Science, Keith A. Nelson, Department of Chemistry, and Vladimir Bulović, Professor of Electrical Engineering, MacVicar Fellow, Co-Director of the Solar Frontiers Center and the Solar Revolutions Project. West's collaborative engagement with faculty and researchers in MIT's Laboratory for Nuclear Science and the Center for Materials Science and Engineering, X-Ray Shared Experimental Facility resulted in the creation of three new "cameraless" film works. Los Angeles-based artist Jennifer West makes 16mm, 35mm, and 70mm films by manipulating the film celluloid to a level of performance. The film emulsion might be doused with various chemical agents or subjected to physical manipulation. The concept-specific materials she employs for each film enhance and reinforce the experiential and performative nature of each work. She often makes her work with social groupings such as friends, students, artists, and writers. Her silent films have a strong synesthetic effect, indicative of the "ingredients" or processes that led to her particular visual expression. She is also known for her "Zines" - DIY photo booklets of production stills of the making of the films- that she gives away at her exhibitions. Her recent exhibitions include "Perspectives 176: Jennifer West" at the Contemporary Arts Museum in Houston, "The Cameraless Film" at the Schirn Kunsthalle in Frankfurt, "Update No. 2" at White Columns, NYC and "How Soon Now" at the Rubell Family Collection. She has been commissioned for special projects and exhibitions at MIT List Visual Arts Center, The Aspen Art Museum and at The TATE Modern.